Even the healthiest specimens have trouble honestly saying that their feet are in tip-top shape. Doctors say people often ignore persistent problems with their feet, which can later develop into more serious issues that extend to the knee, hip, or spine. “Do not walk more than a couple of blocks with anything but sneakers or walking shoes,” advises Dr. Nadia Levy, an expert on bunions, diabetes, foot deformities, and sports injuries at The Center for Podiatric Care and Sports Medicine. She recommends planning ahead and bringing a bag with an extra pair of shoes to change into for more formal occasions. Tell-tale signs of wearing ill-fitting shoes may include: bunions, hammertoes, corns, or calluses. It’s best to try on shoes at the end of the day, when the feet are most swollen, and look for shoes with roomy toe-boxes. Feet can change in size over time, so it’s more important to see that there is an inch of space between the longest toe and the tip of the shoe, rather than relying on a particular number. Another piece of advice Dr. Levy gives is to “STRETCH – especially your calves and hamstrings!” She explains, “Most people have tight calves which lead to many issues in the feet.” Simply raising the heels up off the ground and balancing on one’s toes for a few seconds is a good way to strengthen these muscles. Another ideal stretch routine should be done first thing in the morning before getting out of bed. Sitting with the legs fully extended, angle your toes toward your head — and then point them away. This stretching will work the Achilles tendon and plantar fascia that runs down the arch. Jumping straight out of bed when the muscles are still cold can cause plantar fasciitis inflammation along the bottom of the foot. Some people find it helpful to roll their foot over a tennis ball to stimulate the nerves and improve circulation. You can also pick up marbles or towels with your toes to strengthen the foot. We ran through a list of helpful foot and ankle exercises in a recent article about arthritis. Runners are at high risk for foot problems due to all the wear-and-tear their feet encounter. 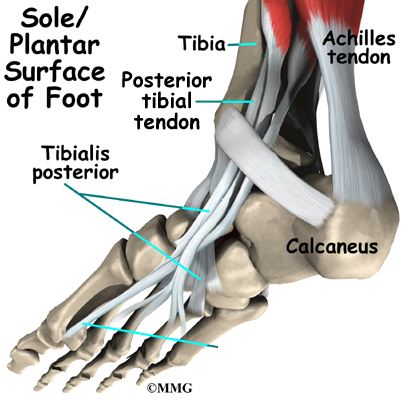 Heel spurs, pinched nerves, and pronation problems are a few of the conditions they may experience. Runners should look at the bottoms of their running shoes to check the wear pattern. If the inner shoe or the outer shoe is wearing down — rather than the usual wear patterns in the heel and ball of the foot — then the runner may be an overpronator or underpronator. Corrective insoles can help stabilize the ankle and foot to prevent injuries. A foot rub should feel good at the end of the day, but feet that feel tender to the touch may have an underlying problem. Weak arches or overworked muscles could be part of a larger issue — and a sign that more supportive footwear is needed. Ankles that creak and crack when rotated indicate a weak tibialis posterior, which could lead to tendon inflammation and shin splints if left untreated. Diabetics need to be especially vigilant for sores that don’t heal right away — which can turn into life-threatening ulcers. Pain and inflammation in the big toe can be a sign of gout arthritis. Soreness or burning in the ball of the foot may signal a pinched nerve. A podiatrist should be seen for all of these conditions. There is no need to live with chronic aches, pains, and soreness when you can take these steps to better foot health today. » Can a Psoriasis Drug Help Patients Manage Type 1 Diabetes?